Approx. 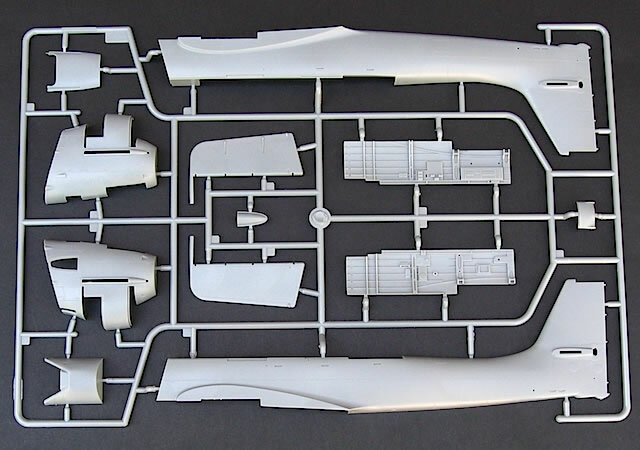 336 mid-grey plastic parts; 13 clear plastic parts; three rubber tyres; one decal sheet containing markings for three aircraft; one fret of photo-etched detail parts. 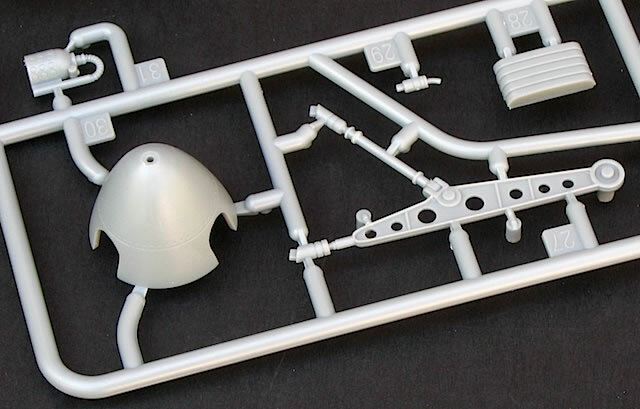 Another mixed bag of a kit from Trumpeter, with high quality plastic parts undermined by apparently poor research into the Ju 87 B. Not fatally flawed, but will take a lot of work to correct. The Junkers Ju 87 ‘Stuka’ is one of the most recogniseable aircraft of World War 2, and indeed any other era. First flown in 1935, the Ju 87 was a key ingredient of Germany’s early battlefield success, but like many other Luftwaffe types was then required to soldier on past its use-by date. Over 5,500 Ju 87s were built before production stopped in late 1944, with some still operational in May 1945. There were four main sub-types of Ju 87. The A series was built in limited numbers and saw action in the Spanish Civil War. It was followed by the definitive Ju 87 B (and closely related Ju 87 R) that is associated with the blitzkriegs of 1939-41. The final D and G series were reasonably successful attempts at extending the life of an obsolescent design, and were used mostly on the Eastern Front. 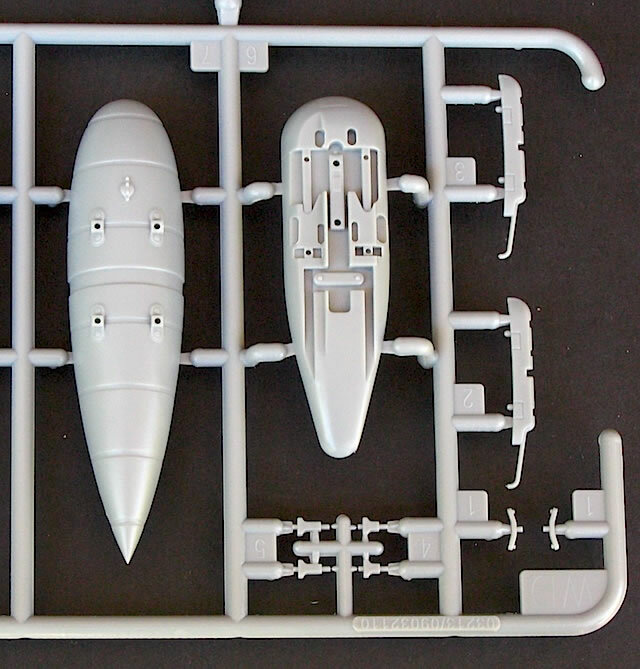 Unsurprisingly for such an iconic aircraft, the Ju 87 has been well represented in kit form. I clearly remember a battered old Airfix 1/72 Ju 87 B model that was an essential actor in the wargames I played with my younger brother in the early 1980s. I can also remember later in the 80s, as a comparatively poor university student, handing over the then princely sum of $76 Australian dollars for the enormous 1/24 Airfix Ju 87 B. This kit still holds up well today, and in any case no one seems likely to release another 1/24 Stuka! In the other scales, most of the older Ju 87 kits have been surpassed by modern examples. 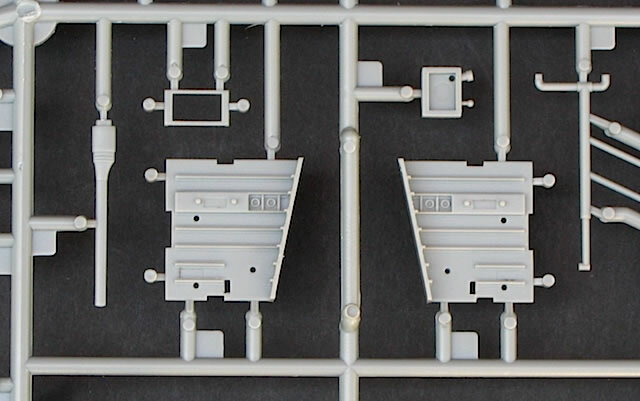 The best of the lot are Hasegawa’s 1/32 Ju 87 D and G kits: released about seven years ago, these are typically well detailed and accurate, and can be built into stunning models. 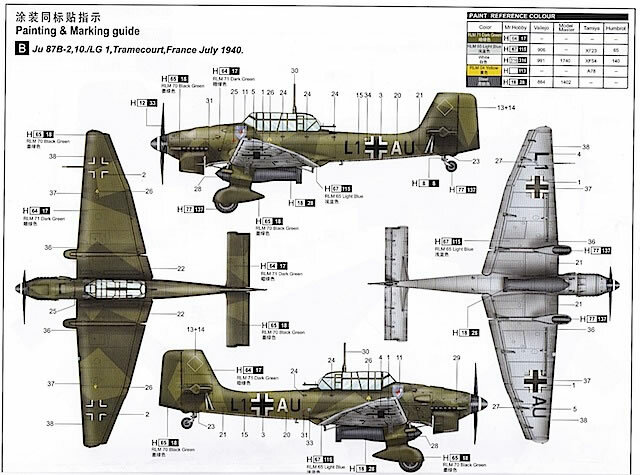 But despite pleas Hasegawa has not produced a 1/32 Ju 87 B, leaving the 1969 Revell and the newer but basic 21st Century Toys kits as the only 1/32 options for modelers wanting to build this variant. 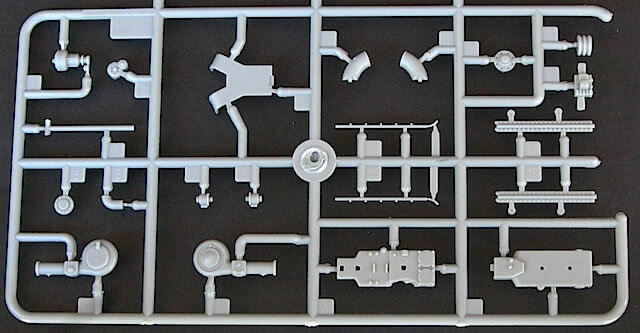 This left a clear gap in the market, into which Trumpeter has stepped with a brand new 1/32 Ju 87 B-2 kit. Trumpeter’s Stuka comes in a largish box that has some real weight to it. 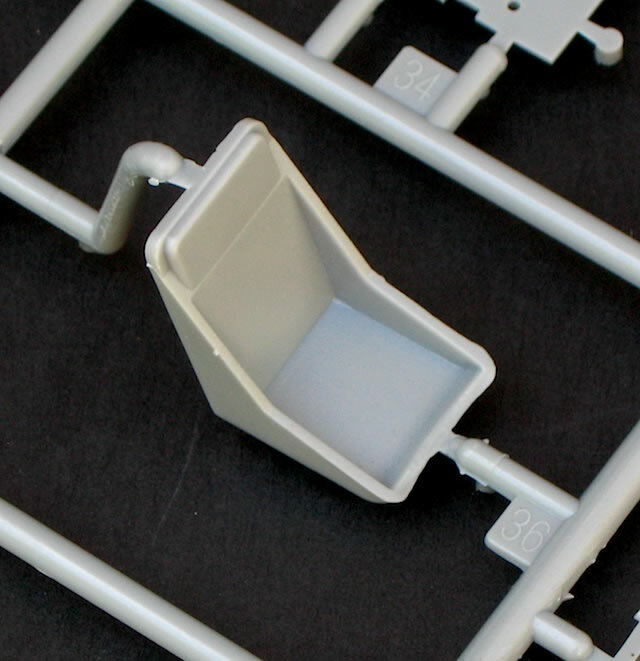 The reason for this becomes clear when you lift the lid: 10 tightly packed sprues of grey plastic that promise a lot of modeling. 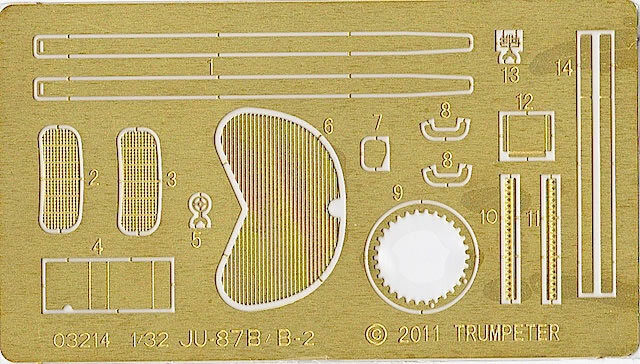 Trumpeter’s packaging is typically thorough, with all sprues and other items individually bagged. 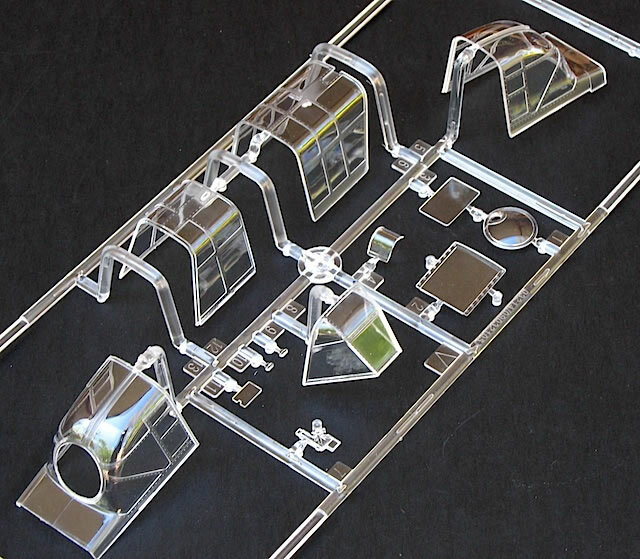 Additional protection is provided for the clear sprue, which has been wrapped in foam and carefully packed into a separate small compartment. 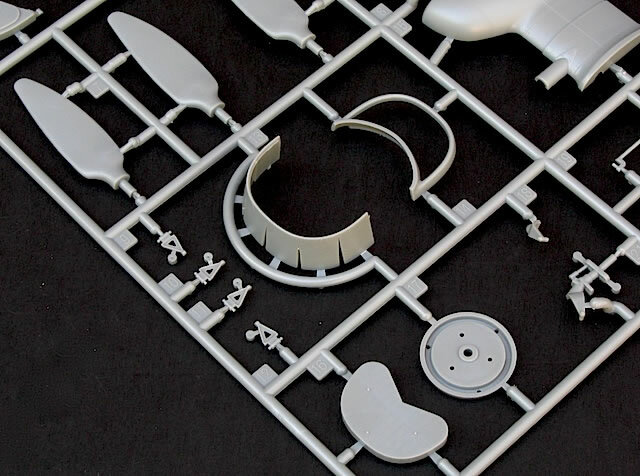 The grey plastic parts are high quality mouldings. The surface of the plastic is very smooth, and I couldn’t find any flash or sink marks. 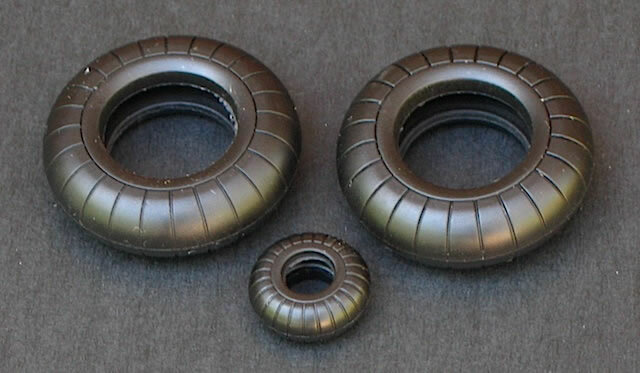 There are plenty of rivets – as there should be for a Ju 87 – but these are very finely reproduced. The rivets are recessed, which isn’t strictly accurate, but they will still look excellent after the model has been painted and weathered. 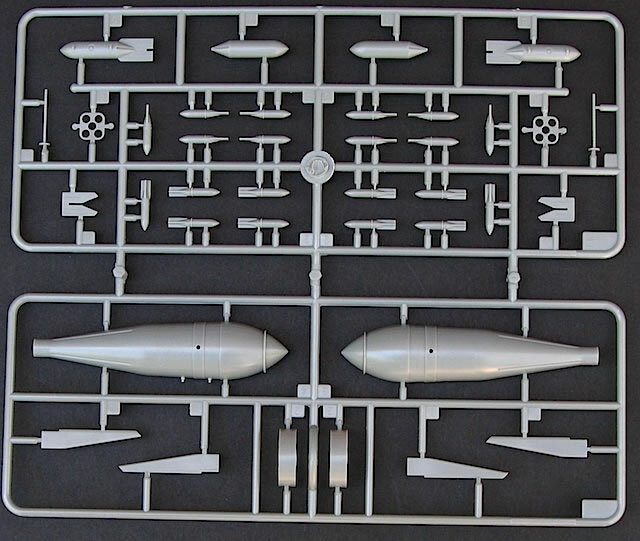 Construction will be slightly more complex than is usually the case with a 1/32 World War 2 monoplane, due in part to the cranked wing design of the real thing. 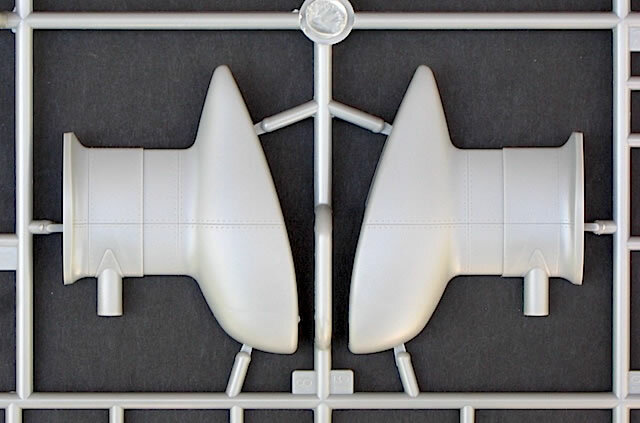 Trumpeter has approached this sensibly by moulding the wings in inner and outer sections, and providing robust spars to join the sections together. These spars should ensure correct dihedral, but I still wouldn’t commit to glue without lots of test fitting and triple-checking alignment. Importantly, Trumpeter has not over-engineered one of the Ju 87’s most distinctive features – the wing control surfaces. 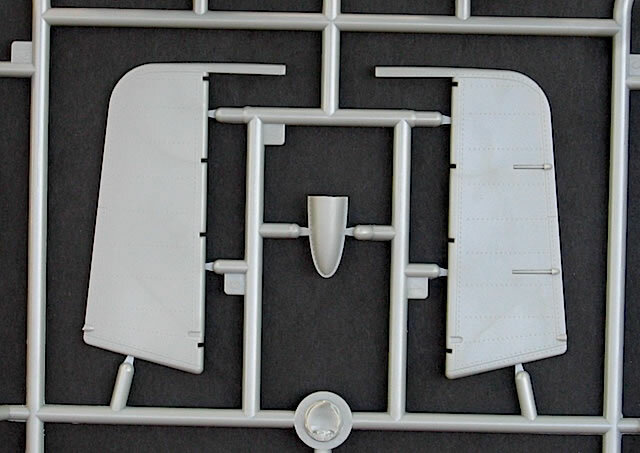 From the instructions, it looks like attaching the ailerons, flaps and associated hinges will be fairly straightforward. 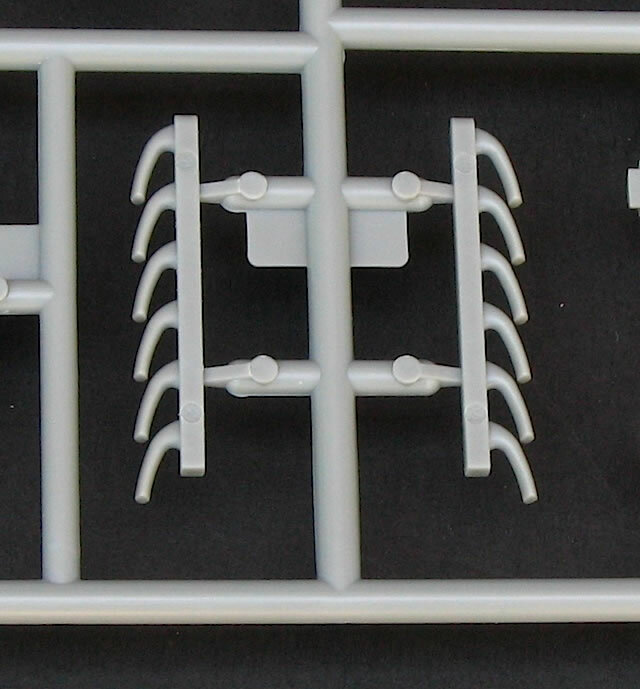 No photo-etched parts are used in these assemblies, which should make for reasonably positive attachments – although in my experience these are always the first bits to give way on a Stuka model…. 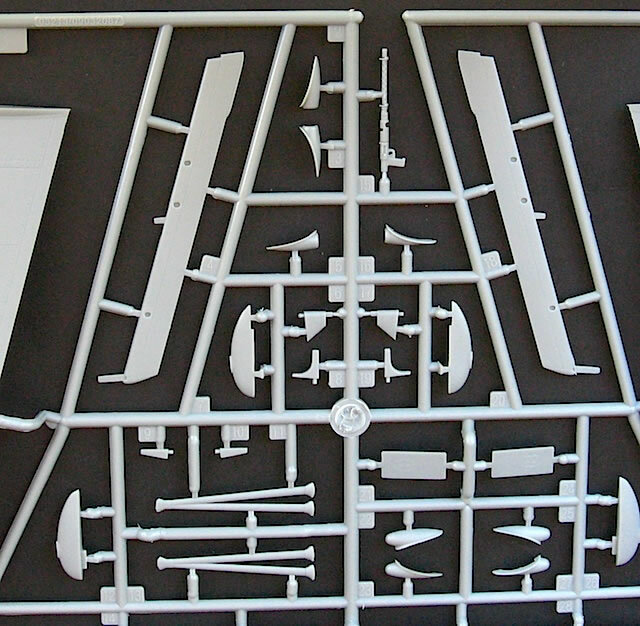 Also adding complexity to the build is the sheer number of parts – well over 300 by my count. Arguably, not all of them are necessary. 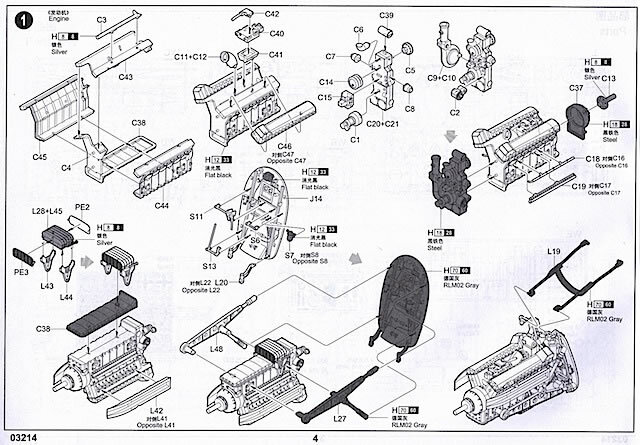 For example, step one of the instructions deals with assembly of the nearly 50-part Jumo 211D engine, which when completed should look great. 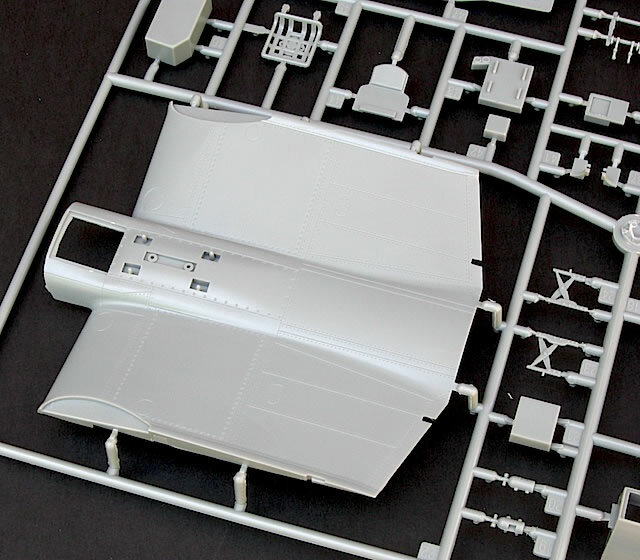 However in step two of the instructions, the engine is enclosed between two cowling halves; Trumpeter has made no provision for it to be displayed. 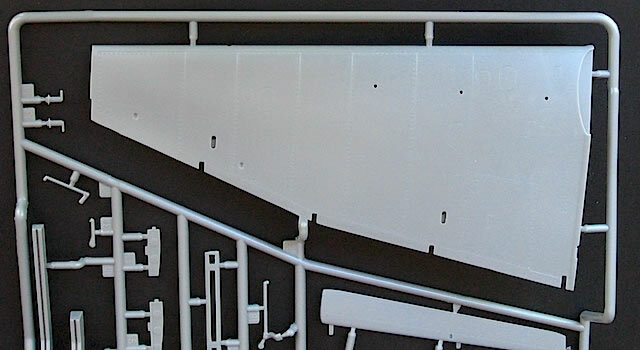 The cockpit is also nicely detailed, and fortunately will remain in view at all times – even if the model is finished with a closed canopy, thanks to the clarity of the transparencies. The cockpit is built up as a tub that is then trapped between the fuselage halves; as with the wings, I would be doing lots of test fitting here. I like Trumpeter’s representation of the long cockpit sidewalls, with their built-in stringer detail and not an ejector pin mark in sight. The instrument panel is also reasonable, with accurate dial layout and some lightly raised details. The one-piece decal that is supposed to go over the panel doesn’t look very convincing, however, and in this scale I would be looking to replace it with individual instrument decals, at a minimum. 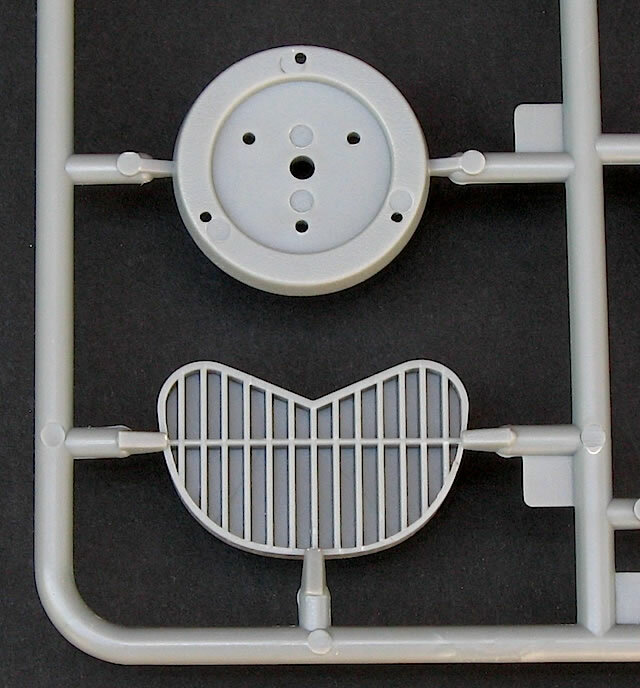 No photo-etched harnesses are supplied, which is unusual for a 1/32 Trumpeter kit. 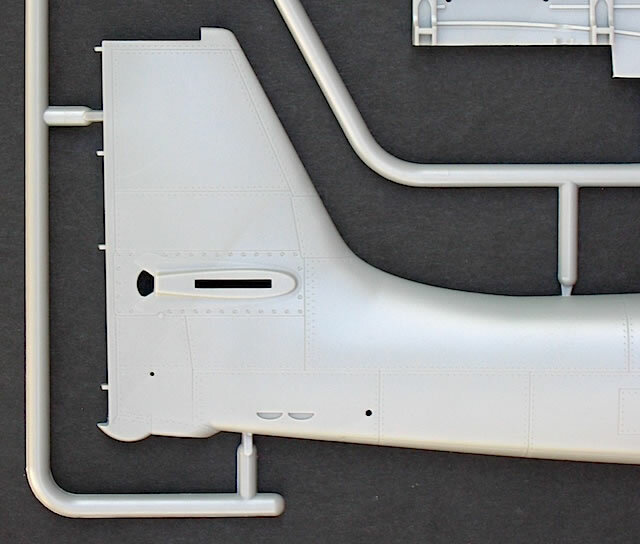 The small photo-etched fret that comes with the kit provides some canopy and cockpit details, the rear radiator face, and sway braces for the drop tanks. The wheels are Trumpeter’s usual vinyl offerings, which fit around separate plastic hubs. 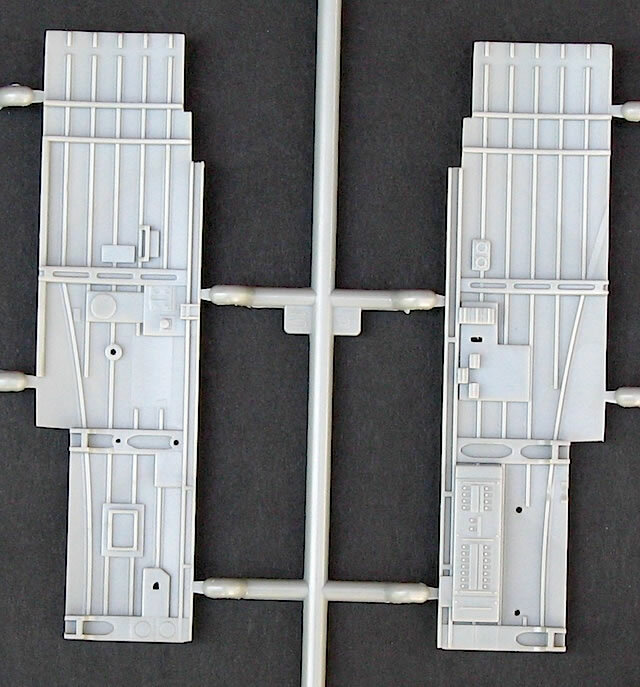 From the instructions it appears that the main wheels have to be trapped between the undercarriage spats when these are assembled, which will make painting slightly tricky. Undersized and incorrectly shaped nose. One of the Ju 87 B’s key identifying features is the complex shape of its forward cowlings and radiator, and unfortunately Trumpeter has not captured this. 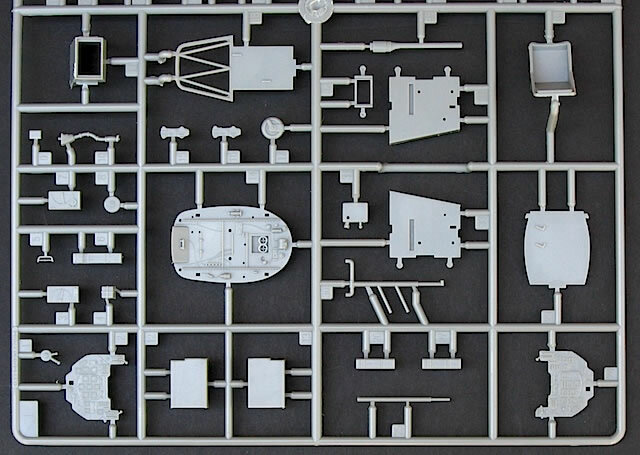 The best way to show this is through a head-to-head comparison with the Revell kit, which despite being more than 40 years old and with problems of its own, is much more accurate in this area than the Trumpeter kit. 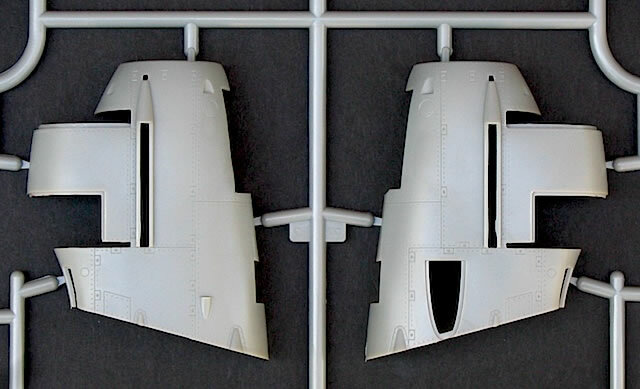 You can see that the Trumpeter nose is too small, and also misses some of the subtle cowling shapes of the Revell parts. 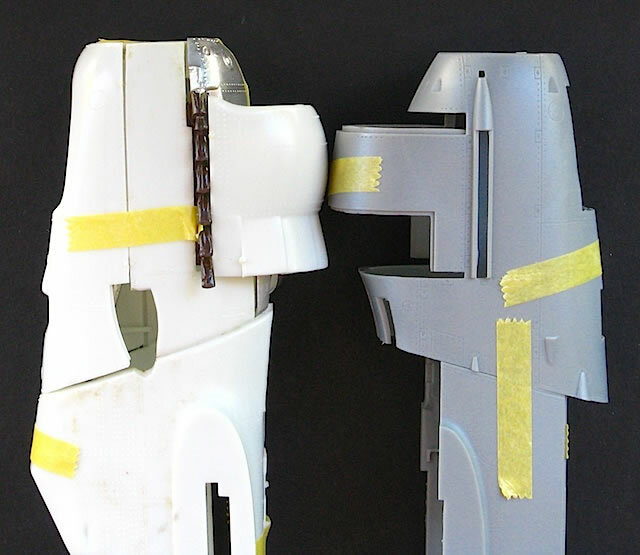 Incorrectly shaped undercarriage spats. Again, this is best illustrated by comparing Trumpeter’s spats with their more accurate Revell equivalents. You can see that Trumpeter has missed the shape completely; hopefully some aftermarket replacements will be available shortly (or you could find a Revell kit to rob). Inappropriate underwing racks and stores. 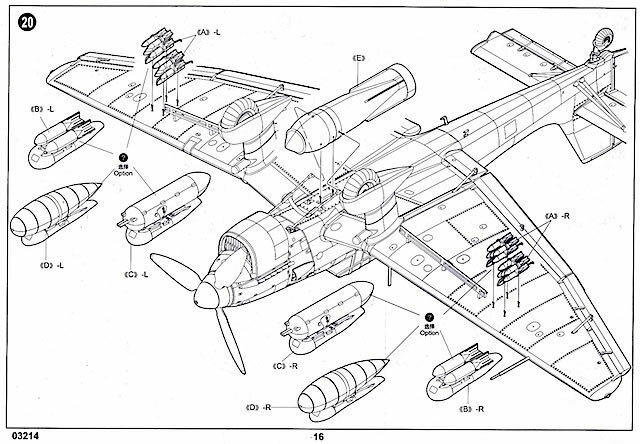 I’m not an expert on Ju 87 weapons fit-out, but I understand that at least some of the stores and racks that have been provided by Trumpeter are not appropriate for Ju 87 Bs, and were only used by later variants. 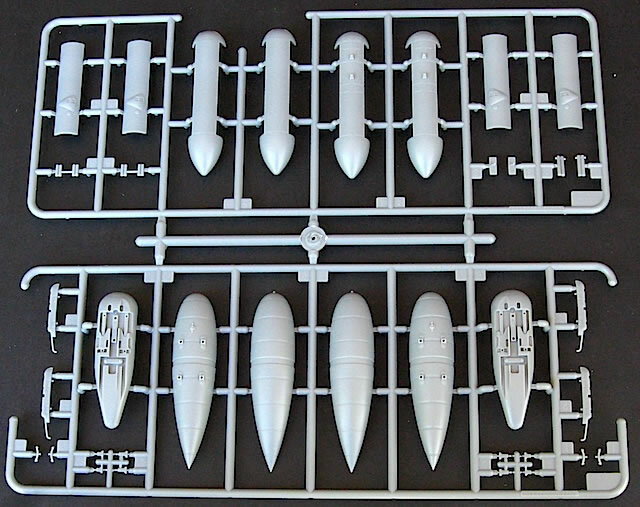 Additionally, only half of the SC 50 bombs that are required to make up a full load have been included; apparently this problem affected all initial boxings of the kit, and Trumpeter is looking to fix it. 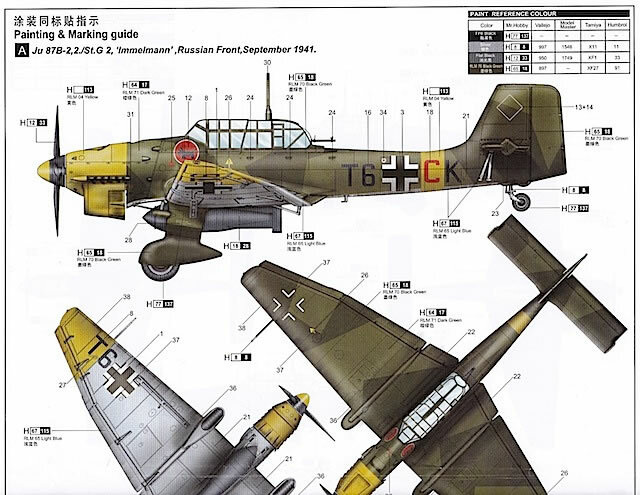 Given these issues, and the variety of weapons carried by Stukas, I would recommend that you check your references carefully before bombing up your Trumpeter model. Once again, the aftermarket should help here. Ju 87 B-2 ‘T6+CK’ of II./StG 2 ‘Immelmann’, operating on the Russian Front in September 1941. This aircraft is finished in the standard splinter scheme of RLM 70 Black Green and RLM 71 Dark Green over RLM 65 Light Blue, with additional colour provided by the yellow nose, underwing tips and fuselage band, and red fuselage code and unit insignia. Ju 87 B-2 ‘L1+AU’ of 10./LG 1, based at Tramecourt, France in July 1940. 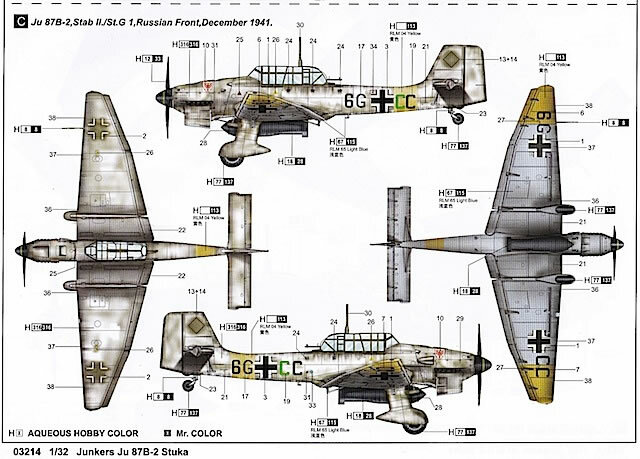 ‘L1+AU’ is also finished in 70/71/65, but lacks the additional colour of option A.
Ju 87 B-2 ‘6G+CC’ of Stab II./StG 1, operating on the Russian Front in December 1941. This aircraft is depicted with a tatty-looking winter whitewash, presumably applied over a 70/71/65 scheme although this is not pointed out by Trumpeter. I haven’t been able to find photographs of these machines to confirm Trumpeter’s colour and marking call-outs, but the latter are reasonable for Ju 87 Bs operating in these theatres in 1940-41. I would, however, question the accuracy of the simplified Balkenkreuz that Trumpeter has supplied for the upper wings of all three aircraft. I don’t think this style of marking was applied until later in the war, although I am happy to stand corrected. Trumpeter’s full colour A3 painting and marking guide is very well done, with four-view illustrations of each option and RLM colours called out in their Mr. Hobby, Vallejo, Model Master, Tamiya and Humbrol equivalents. 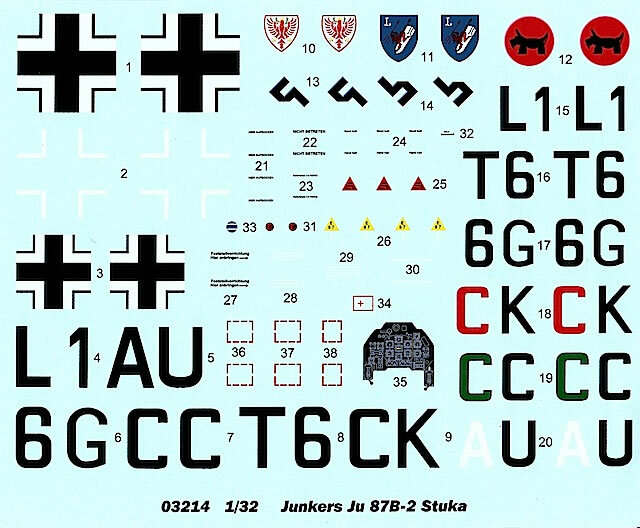 The large decal sheet looks impressive at first glance, and the Balkenkreuz and code letters and numbers are crisply printed. Unfortunately this finesse is not carried over to the smaller unit markings, which suffer from some registration and opacity problems. I don’t speak German, so can’t vouch for the accuracy of the maintenance stencils. The swastikas are split in two, and appear to be slightly out of register. 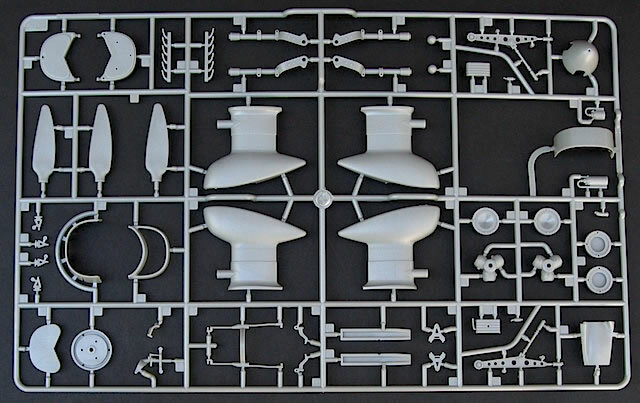 This kit is another mixed bag from Trumpeter, with the high quality of the plastic parts undermined by apparently poor research into the subject aircraft. This is the only explanation I can find for how Trumpeter managed to get the nose and spats, particularly, so out of kilter, because the Ju 87 B is not an obscure or poorly documented aircraft. The problems with this kit can be fixed, but they will take a lot of work. 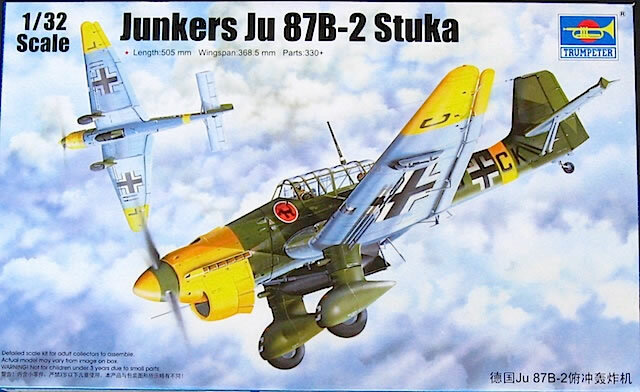 Trumpeter has missed an opportunity to deliver a definitive 1/32 Ju 87 B-2; hopefully, if it has plans to develop kits of any other Stuka variants, it will do its homework a little more thoroughly before these are released. In Model Airplane International's January 2013 edition, John "Tigger" Wilkes will undertake a correction project for this kit. Worth a look!